How can managing woodland improve your shoot? Managed woodland has a diverse understory, which creates better cover and holds more birds in the area. Unmanaged woodlands have a sparse ground cover and soon become cold and draughty. This event aims to provide information on how to manage your woodland without disrupting the shoot. manages the woodland for both firewood production and shooting. ensure suitable clothing and footwear is worn. This event is for woodland owners and managers in the West Midlands region. ofgem recently held an event to provide some help and informaton refarding teh RHI process, below you will find some pdfs that may help you understand the system a little better. Britain’s trees, woodlands and gardens have been under attack before, but new and more sinister diseases are threatening the existence of some of our most familiar and best loved trees. Heartwoods invites you to a workshop to find out about the latest research in how to manage this urgent problem. You will learn how to recognise a variety of tree diseases and how to manage them to reduce losses, and contact and prevent their spread. A leading professional from Forest Research will be looking at current concerns and future threats, covering, oak declines, phytophthora diseases, red-band needle blight, bleeding cankers, and likely new diseases that may arrive in the UK. FERA will be providing a detailed insight into what we have learned from the impact of phytophthora ramorum in the South-West and Wales and what the implications are for the West Midlands. The workshop includes indoor presentations followed by tours of local woodlands to see trees and plants where disease is now evident. Event costs £10.00 (which includes lunch and refreshments) and is aimed at those employed within the woodland industry and woodland owners within the West Midlands region. Confor has produced a report on the benefits of managed forests to help inform decision-makers, the wider public and media of the diverse benefits derived from forests, forest management, timber and participating businesses. It has already been sent to over 200 MPs and civil servants, as well as to members of the Independent Forestry Panel (England). It is now released for wider discussion and the industry is encouraged to promote it. The need for increased softwood planting and production of raw material for industry. Confor’s head of policy, Rupert Pigot, commented, “This report is a useful source of basic information for all those taking an interest in the future of forestry, especially in England, but also across the UK. I hope it will increase understanding and awareness of this uniquely valuable sector. Everyone is encouraged to take a look and think of people they know who would be interested in reading it. Woodfuel is a byproduct of growing timber – this was the key take home message from a demonstration event, hosted at the Whitfield Estate, Wormbridge. More than 20 farmers and landowners were given a practical tour of “The Big Wood” showing the opportunities of coppicing, regeneration, pure oak stands and thinning, while discussing the commercial markets, usage and returns. All woodland management involves assessing the woodland and the “suite of opportunities” available; woodfuel is just one of those opportunities. Nick Maskery – of Heartwoods described the process of producing a “woodland inventory,” which would be followed by a full “woodland management plan.” Once both these are in place long term objectives are in place and the option to apply for grant funding, from replanting to capital investment becomes live. 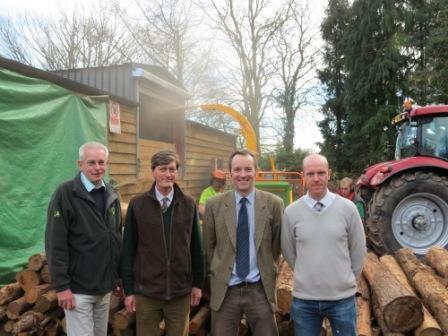 Pictured: Wood chip processing is seen behind, from left, Nick Salt, of the Forestry Commission; William Shuttleworth of Balfours with Berringtons; Graham Taylor of Pryor Ricketts Silviculture and Nick Maskery of Heartwoods. An event for all individuals and groups involved in owning or managing woodland. Are you aware of the new common sense guidelines relating to tree management and safety? Have you got the right level of insurance for your woodland? Do you know your rights and responsibilities when people come on your land? How do you manage different users? What about working with volunteers of Forest School groups? Are you complying with Health & Safety? Managing contractors and selling timber……… and what about wildlife? A day of lively presentations, interactive workshops, informationand discussion.Not to be missed. Buffet lunch and refreshments included—Book now! Conference costs £10.00 including lunch and refreshments. This one day event led by The Deer Initiative will look at the various issues caused by deer within woodlands and how their presence affects woodland management and potential timber production and values. Ranger’s will be on hand giving demonstrations in gralloching and carcass inspection as well as simple butchery, whilst looking at venison processing and marketing. We will then visit Croft Castle, next to Gatley Park, and look at the impact deer has had on the woodlands there and how it affects biodiversity. There will be a hot venison meal and refreshments served in the woodlands at the end of the walk. This event will take place outdoors so please ensure suitable clothing and footwear is worn. The event costs £5.00 which includes lunch and refreshments and is targeted at Woodland Owners and Managers within the West Midlands region. Starts at 9.30am, finishes by 2.00pm. Umbrella supplier Booth Brothers in Sheffield entered the history books today by becoming one of the first places in the UK to get the government’s Renewable Heat Incentive. Its offices, housed in an 18th century former corn mill in Penistone, will be kept warm through an underfloor heating system powered by a renewable energy heat pump. The Booth Brothers installation supplies offices which are heated by underfloor heating using water heated by the 24kW water source heat pump accredited under the Microgeneration Certification Scheme (MCS), and with an efficiency above that required by the RHI. It has been accredited under the ‘small commercial heat pumps’ tariff of 4.5p / Kilowatt-hour (kWh) and receive quarterly payments (Based on metered heat generation) for a twenty year period. The Broadgate Farm Cottages has installed a 4.3kW ground source heat pump which has been accredited under the Microgeneration Certification Scheme (MCS) with an efficiency above that required by the RHI. It supplies space heating and hot water. The heat output is measured by an appropriate heat meter. It has been accredited under the ‘small commercial heat pumps’ tariff of 4.5p / Kilowatt-hour (kWh) and receive quarterly payments for a twenty year period. Currently around half of the UK’s carbon emissions come from the energy used to produce heat – more than from generating electricity. The RHI will reduce emissions by 44 million tonnes of carbon to 2020, equivalent to the annual carbon emitted by 20 typical new gas power stations. Over 95% of heat in the UK is currently produced by burning fossil fuel but with North Sea supplies now in decline leading to an increase in imports, low carbon alternatives are needed. The guides are technical and aimed at buildings managers, surveyors, developers and others who are in a position to help make decisions about how buildings are heated. The guides do not discuss grants, incentives or policy but instead aim to increase the technical knowledge of the reader and help them evaluate the suitability of their site for biomass heating before bringing in external consultants. We hope that the work will also help the reader evaluate the quality of work provided by consultants during any further feasibility/system design work that is under taken. The work builds on guides produced by the Carbon Trust. The work was funded by DECC and FC Scotland with technical input from Defra and Hetas. Most of the technical information was complied by David Palmer, an independent engineer with lots of experience with woodfuel systems, mainly in Scotland. David also works with the Carbon Trust so the approach adopted by the guides compliments rather then contradicts existing information. Early drafts of the guides were reviewed by industry via the REA.